Three enthusiastic newsletter readers share their observations and research on four Fabergé wedding anniversary commissions – two clocks made for the Russians rulers, a pair of wine coolers and a massive kovsh still treasured by the Danish Royal Court today. Fabergé workmasters Mikhail Perkhin (1860-1903) born in Karelia, Russia, and Julius Rappoport (1851-1917) from the Kovno province, now part of Lithuania, became master goldsmiths in 1883/84. They were active with the Fabergé firm in St. Petersburg until 1903 and 1908, respectively. Less than ten years after receiving their master papers, a process which can take eight or more years to complete, the Perkhin and Rappoport workshops created monumental wedding anniversary presents for the Russian rulers in 1891, and the Danish monarchs in 1892. 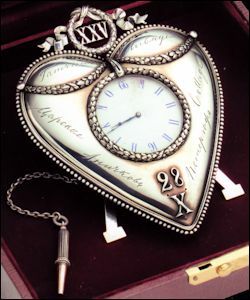 The Alexander III 25th Anniversary Clock was ordered by Grand Duke George Mikhailovich from the House of Fabergé on behalf of 32 members of the Russian Imperial Family. The group, which comprised the uncles and aunts of the Sovereign together with their spouses and children, ordered an allegorical clock as a sign of their affection and respect. 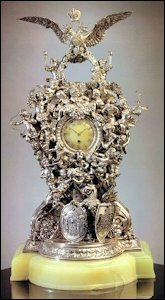 The undulating baroque architectural form of the clock is similar to cartel clocks of the Louis XIV period after which it was modeled, but the face of the clock writhes with 25 individual putti each representing a year of the couple’s marriage, and an enormous Romanov family griffin supporting the two heraldic shields of the Emperor and Empress, signifying the union of the Houses of Russia and Denmark. The putti are individually modeled, each with its own attribute. Some hold flowers, others blow trumpets, one even reads sheet music on which the first bars of “God Save the Tsar” are engraved where only the putto may see them. The verso of the clock is engraved with the names of each of the donors, and at the top, in an elaborately cast and chased wreath, a large diamond-set “chiffre” or monogram of the Emperor and the Empress was mounted (it was subsequently removed after the Revolution, it was either broken up, or its whereabouts are unknown), while a crowned double-headed eagle soars above the entire composition. The clock was initially delivered in “oxidized” silver (meaning patinated to a dark matte finish), but we know from archival photographs that by 1902, extensive polishing had returned the clock to a fairly bright silver. The piece was first exhibited at the famous von Dervis exhibition sponsored by Empress Alexandra Feodorovna, and after the exhibition, the piece was returned to the Antichkov Palace, where it remained in the Benois-designed “Blue Salon” until the revolution. The clock was left behind by the Dowager Empress when she escaped Russia through Kiev and the Crimea during the revolution. It was sold by the Soviet authorities later. The clock was rediscovered in an American collection, and was exhibited for the second time in the 1993-1994 exhibitions, Fabergé: Imperial Jeweler at the State Hermitage Museum in St. Petersburg, Musée des Arts Décoratifs in Paris, and then at the Victoria and Albert Museum in London. Extensive research and documentation accompanied the clock, provided by the noted experts Dr. Géza von Habsburg, Dr. Marina Lopato, and the Russian Fabergé independent researcher, Dr. Valentin Skurlov. When the owner decided to sell the clock in 1996, Christie’s New York was chosen, where I was then a specialist in the Russian Works of Art department. The piece generated extraordinary excitement for many reasons. 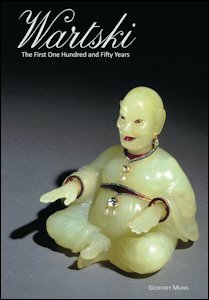 It was among the very first times access to Russian sources for research was available, and thanks to the work of von Habsburg, Lopato, Skurlov, Christie’s International Russian department head Anthony Phillips, and London department specialist Alexis de Tiesenhausen, a new level of scholarship for a Fabergé object was available to potential buyers. 1994 was the also first time a Fabergé object at auction (The Winter Egg) was published with an original bill but the clock was the first time original internal documentation from both Fabergé and the Imperial Archives were used as resources. When we ask our museum visitors to think of great aristocratic Russian romances, they inevitably suggest the last Russian Emperor Nicholas II (1868-1918) and his consort, Alexandra (1872-1918), the star crossed pair who disregarded their parents’ wishes and married for love. However, Nicholas’ father, Alexander III (1845-1894), was also happily wed to a woman he adored. Princess Dagmar of Denmark (1847-1928), the second daughter of King Christian IX of Denmark and his consort Louise, was to marry the heir to the throne of all Russia. She became betrothed to the handsome and dashing Tsesarevich Nicholas Alexandrovich (1843-1865) at the end of 1864, receiving an imposing multiple-strand necklace of large, perfectly matched pearls from his parents Alexander II and his wife Empress Maria Alexandrovna. Unfortunately, tragedy struck before the wedding could take place, he fell ill in Nice and died of meningitis in 1865. 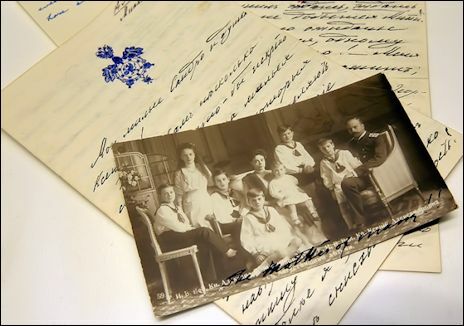 Not to be deterred, her mother and future mother-in-law decided she should marry his brother, Grand Duke Alexander Alexandrovich, the new Tsesarevich and later Alexander III. He was a man equally tall, well-built, attractive and very strong. He was a bull of a man! It is said he used to entertain his dinner guests by bending iron rods and silverware with his bare hands. As tall and strong as Alexander was, Dagmar was tiny and petite. Alexander had been enamored with the lively princess even while she was engaged to his brother. After Nicholas Alexandrovich’s death, Alexander had some initial reservations about marrying his brothers’ former fiancée, but once he decided to ask for her hand in marriage he was completely committed to the relationship which proved to be very successful (Nelipa, Margarita, Alexander III: His Life and Reign, 2014, 116-124). The new Grand Duchess adopted the Russian Orthodox religion, took the name Maria Feodorovna and began learning about her new country, its language, and customs. The marriage took place in the Great Church of the Winter Palace in late 1866. As the days together passed, Maria became exceedingly fond of her big, steely grey-blue eyed strapping bear of a husband, resulting in a bond that was both romantic and rewarding. 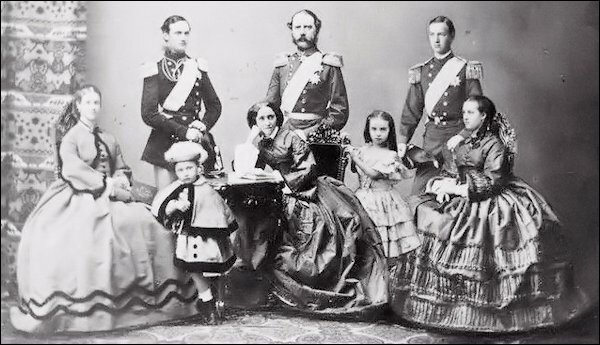 They had five children who survived into adulthood: Nicholas (1868), George (1871, who died of tuberculosis in 1899), Xenia (1875), Michael (1878), and Olga (1882), a sixth child Alexander (1869) died in infancy. One cold early spring day in March of 1881 their happy life was shattered when the Emperor, Alexander II, was assassinated by revolutionary terrorists while returning via the Griboedov Canal to the Winter Palace. The famous Church of the Savior on Spilled Blood was erected on the spot between 1883 and 1907. 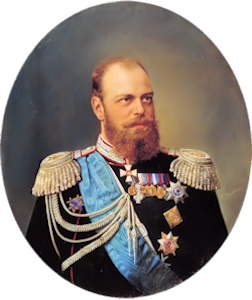 Russia had a new Emperor, Alexander III, a man who surely had not meant to assume power so soon, since his father had been a healthy man. Despite the change in their circumstances, Maria and Alexander remained close. She was a devoted mother and doting parent, and was also an elegant consort who brought a great deal of style to the court of the most powerful ruler in Europe. She set a high bar for elegance and the court slavishly followed her whims. 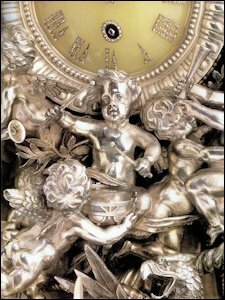 The very personal gift discussed in this article is a silver desk clock made to commemorate the silver wedding anniversary of the Imperial pair. 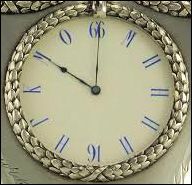 It was presented at the same time as the Alexander III 25th Anniversary Clock from the Perkhin workshop discussed above. Was this private gift the embodiment of his feelings for the petite Tsarina? It is in the shape of a heart. The names of the couple’s residences are engraved around the edge of the clock: Gatchina, Livadia, Tsarskoe (Selo), Anichkov, Peterhof, and the Cottage. Were these references to fond memories and freer days? At the top is the Roman numeral 25 commemorating their anniversary, and at the bottom their wedding date (O.S. October 28, 1866 [November 9, 1866], and the years (18)66 and (18)91 are in place at the 6th and 12th chapters. In addition, the chapters one through five are replaced with Alexander’s pet name for Maria … MINNI. The other chapters of the clock face are the letters of their children’s first names, NGKMO, for Nicholas, George, Xenia, Michael, and Olga. A beautiful laurel ribbon rests atop the clock completing this most sentimental and thoughtful reminder of how devoted they were to one another. Heritage Auction Galleries in Dallas, Texas, featured the clock in an auction — The James C. Russo Collection of Russian and British Royal Objects, April 24, 2008, Lot 36054). In an interview Mr. Russo described the clock as “the epitome of what I love” (to collect). Featured on the cover of the auction catalog, this charming little desk clock, has been passed gently from collector to collector since leaving Russia, and now it rests in the McFerrin’s magnificent collection. How fitting it is that the Imperial clock is enjoyed by a Texas couple who are so fond of one another! Docents at the Houston Museum of Natural Science eagerly await the news when the clock will join the stunning collection of 500+ items already on view from the McFerrin Collection. My special thanks to the McFerrin Collection, and especially to Mrs. Dorothy McFerrin in particular for information regarding the desk clock, and to John Atzbach for photographs and additional details. A video, The Will of Empress Maria Feodorovna (Завещание императрицы Марии Федоровны), was recently posted on Paul Kulikovsky’s Romanov News Facebook page. The biographical documentary published in 2006 coincides with the reburial on September 28, 2006, of the Dowager Empress Maria Feodorovna when she was laid to rest beside her husband, Emperor Alexander III, at the Peter and Paul Cathedral in St. Petersburg. Of particular interest to Fabergé enthusiasts is the expert commentary by Ole Villumsen Krog, former Director of the Royal Silver Room beginning at 22:19 minutes on two important Fabergé objects in the Danish Royal Collection. Commissioned from the House of Fabergé the objects were presented to King Christian IX (1818-1906) and Queen Louise (1817-1898) of Denmark, the parents of Empress Maria Feodorovna (1847-1928), for their Golden Wedding Anniversary celebrated on May 26, 1892. 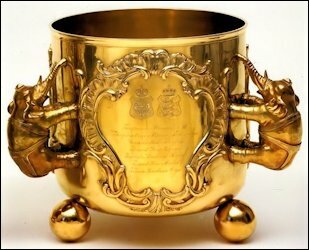 The impressive family heirlooms consist of a pair of silver-gilt wine coolers and a colossal silver-gilt kovsh. 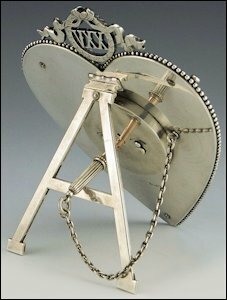 Both were created in the workshop of workmaster Julius Rappoport, who specialized in large silver items and was an active workmaster from 1883-1908. Fabergé’s invoice for both the wine coolers and the kovsh dated October 15, 1892, states the order totaled 10,000 rubles. To this day the gifts retain their original, fitted oak cases with brass fittings. The silk label inside each case bears the name ‘C. Fabergé’ in Latin letters beneath the Imperial eagle and ‘St. Petersburg’ in Cyrillic. The label within the kovsh’s wooden case can be clearly seen in the video. The wine coolers were given jointly by the children, sons- and daughters-in-law, and grandchildren of King Christian IX and Queen Louise to commemorate 50 years of marriage. Each silver-gilt wine cooler is cylindrical in shape, stands 33 cm (13 in.) tall on three ball feet, and is accentuated with three elephant-shaped handles. They pay homage to Christian IX’s sobriquet as the ‘father-in-law of Europe’ by being engraved with the coats-of-arms of each of his six children and their spouses within their own rococo cartouche. Under each family’s corresponding coats-of-arms, the names of the 47 donors are engraved in French within the cartouches. The royal Houses of Denmark, Russia, Cumberland, Orleans, Sweden-Norway, Great Britain, and Greece are represented on the pair of wine coolers. Alexandra’s Engagement to the Prince of Wales. Left to right: Dagmar, Frederick, Waldemar, Louise (Later Queen), Christian (Later King), Thyra, William, and Alexandra. 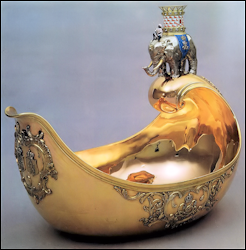 The massive Imperial presentation kovsh was a personal gift from Emperor Alexander III of Russia and his wife Empress Maria Feodorovna (neé Princess Dagmar of Denmark). It measures 88.2 cm in length, 74.1 cm in height, and 61.8 cm in depth (35 x 29 x 24 inches, Fabergé Research Newsletter, Winter 2013-14). In the video Krog explains the silver-gilt kovsh has the capacity to hold approximately eight bottles of champagne on ice and is still used by the Danish Royal family today. Of traditional form with a scrolled handle it is surmounted by an elephant with a turret on its back, the elephant being a symbol of chastity and the defense of the Christian faith. Two extant, original Fabergé design sketches for this golden anniversary kovsh along with a design for an unrelated Imperial presentation kovsh were sold as one lot by Christie’s London on April 27, 1989, for 4,950 GBP. 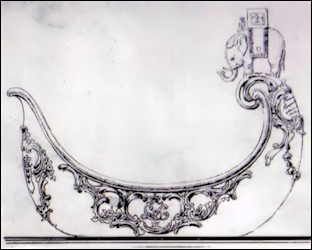 Neither sketch shows the turret atop the elephant’s back, but one can presume the turret was incorporated into the kovsh’s design to emulate the badge of the Order of the Elephant, Denmark’s highest chivalric order. 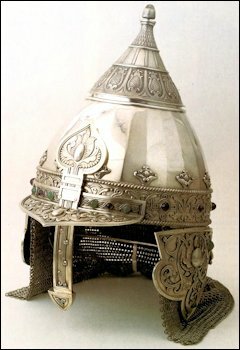 The kovsh’s silver elephant has gilt tusks, a figure of a Moor mahout riding on its neck, a red and white enameled turret set with clear quartzes on its back, and a blue-enameled saddle applied with royal monograms on each side. The video also reveals the elephant has clear stones for eyes and a square, clear stone in its forehead. The front of the kovsh bears the coats-of-arms of the Royal Houses of Denmark and Hesse-Kassel within a rococo cartouche, and the sides are decorated with the conjoined, crowned monogram ‘CLIX’ and ’26 Mai 1842-1892′, the dates of the wedding and the golden wedding anniversary, within foliage and scroll cartouches. Riana Benko, DeeAnn Hoff, and Ulla Tillander-Godenhielm contributed to the research for this essay. Christie’s London, Designs from the House of Carl Fabergé, April 27, 1989, Lot 404. Krog, Ole V., Maria Feodorovna Empress of Russia: An Exhibition about the Danish Princess Who Became Empress of Russia, 1997, 444-448.
von Habsburg, Géza and Marina Lopato, Fabergé: Imperial Jeweler, 1993, 232-235. Cigarette case given by Grand Duchess Maria Pavlovna to her maid-of-honor Princess Catherine (Ekaterina) Pavlovna Galitzine (1896-1988), daughter of Prince Paul Golitsyn (1856-1914/16), Nicholas II’s Master of the Imperial Hunt, and Princess Alexandra Meshcherskaya (1864-1941), a maid-of-honor to Empress Alexandra. In 1922, Catherine married Capt. James Haldane Adair Campbell (1893-1945), a son of the Laird of Tullichewan and great-grandson of William F. Havemeyer, the illustrious mayor of New York. The Campbell family crest and motto, ‘True to the End’ was added to the underside. Sale features objects from American private collections including some from descendants of Grand Duke George Mikhailovich (1863-1919), the grandson of Emperor Nicholas I and first cousin of Emperor Alexander III. 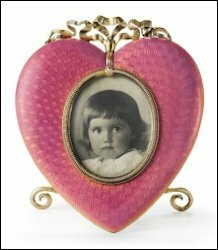 Among the highlights of the collection is a photograph frame, purchased directly from Fabergé’s St. Petersburg shop by Emperor Nicholas II in July of 1907. The correct identification of materials in Fabergé pieces is not always an easy task. Historical information is not at all times absolute or accurate, and descriptions are very often based on assumptions, incomplete information, or conscious embellishment. 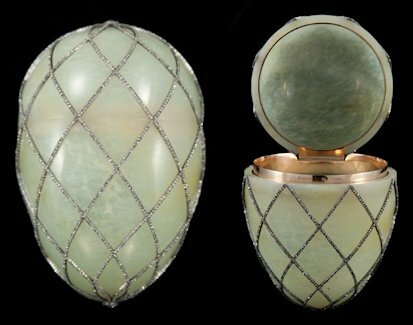 A question about gem and mineral identifications of Fabergé objects recently came up in conversations about the shell of the Diamond Trellis Egg in the McFerrin Collection, specifically whether it is jadeite or bowenite. One way of testing the material is by spectroscopic analysis, which determines the chemical or physical constitution of the stone. But this type of testing is rarely done, even to the highest profile Fabergé objects. Mineralogist James D. Dana in 1850 named bowenite after George T. Bowen (1803-1828), a chemist and mineralogist teaching at the University of Nashville, Tennessee. Bowen first discovered this member of the serpentine mineral family in Rhode Island, where it is now the state mineral. 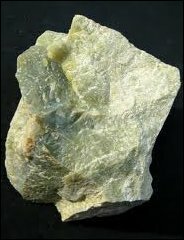 It can be identified not only spectroscopically, but can be differentiated from the two types of true jade, nephrite and jadeite, by measuring its specific gravity – bowenite is 2.6, nephrite 3.0, and jadeite 3.3. Archival records, such as invoices, sales logs, or personal letters, would seem to be a reliable source for information on what stones or metal were used in creating a Fabergé object, but they can be misleading. Mistakes creep in when sales log entries are made in haste, or just the color of a stone is recorded, or some materials are left out completely. 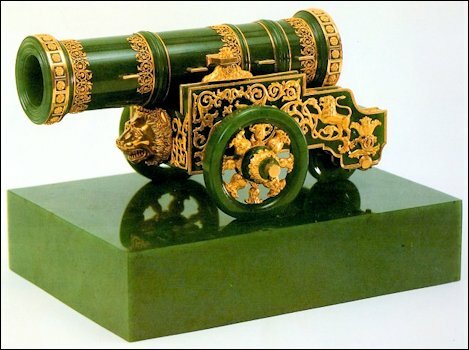 And in the case of bowenite, Fabergé did not use the term in his invoices, but generally referred to stones from the serpentine family as jadeite, which it very much resembles, so much so that the materials were often used interchangeably. In answer to the question initiating this discussion, the shell of the Diamond Trellis Egg is identified by the Houston Museum of Natural Science as bowenite. Another common issue in the Fabergé invoices is a liberal use of the term “topaz” to refer to stones in the quartz family. Perhaps it was seen as a more elegant and marketable term, so “smoky quartz” became “smoky topaz”, and “citrine quartz” became “golden topaz”, etc. Of course, product enhancement has been a common practice in the advertising world for centuries, but it can be a source of confusion, too. As long as one understands these anomalies of fact exist, one can approach material identification more objectively. “Imperial Easter Eggs: A Technical Study” in von Habsburg, Géza, and Marina Lopato, editors, Fabergé: Imperial Jeweler, 1993, 76-83. “The Many Golds of Fabergé” in Gilded Metals: History, Technology and Conservation, Terry Drayman-Weisser, editor, 2000, 297-306. “Mrs. Pratt’s Imperial Easter Eggs” in von Habsburg, Géza, et al., Fabergé Revealed at the Virginia Museum of Fine Arts, 2011, 88-101. We are searching for six miniatures (ca. 1.5 in. high x 1 in. wide) by Zehngraf of the ‘Emperor Alexander III in different uniforms’ which fit in the folding frame identified by Anna and Vincent Palmade as the missing surprise of the 1896 Alexander III Portraits Egg. He was born in Copenhagen, Denmark, in 1857 and studied in Denmark and Germany. He lived in Berlin from 1889. Zehngraf carried out orders for miniature portraits for all the royal families of Europe, including many for the Office of His Imperial Majesty, the Tsar. The miniatures were often used in the manufacture of presentation items. Zehngraf’s work is a feature of the 1896 Tsar Imperial Egg with Revolving Miniatures, the 1898 Tsar Imperial Pelican Egg, and the 1898 Tsar Imperial Lilies of the Valley Egg. He died in Berlin in 1908. (Lowes, Will, and Christel Ludewig McCanless, Fabergé Eggs: A Retrospective Encyclopedia, 2001, 245) Contact the Editors. Seven Fabergé objects from the permanent collection including an 1896 Julius Rappoport Table Clock are shown. The very popular exhibition Fabergé from the Matilda Geddings Gray Foundation Collection currently at the Metropolitan Museum of Art in New York City is on view through November 27, 2016. Ed. note: No Fabergé objects were included in the sale. The 1907 Yusupov Egg presented by Prince Felix Yusupov to his wife Zenaide on their 25th Wedding Anniversary. A part of the Fondation Eduoard et Maurice Sandoz in Lausanne, Switzerland, the egg is rarely exhibited. The St. Petersburg Fabergé Museum is short-listed as a “Museum of the Year” for the Art Newspaper Russia Prize in one of the five nominations categories: Book of the Year, Exhibition of the Year, Museum of the Year, Restoration of the Year, and Personal Contribution. The ceremony will be held in Moscow on April 2, 2015. Devotees of the works of Carl Fabergé know where to find them: at Hillwood Museum, the Virginia Museum of Fine Arts, and other well-known museum collections; in the showrooms of specialist shops, such as Wartski and A La Vieille Russie; and at Christie’s and Sotheby’s auction rooms. Many of the world’s private collections have been extensively catalogued, documented, and lent for exhibitions, and are therefore known to students of Fabergé. What I find exciting is discovering the overlooked piece of Fabergé where you would least expect to see it. There is a certain thrill in finding the forgotten picture frame, an incorrectly cataloged Imperial cigarette case, or an unidentified objet d’art in a small museum collection. Recently I was writing about an obscure facet in the life of Kaiser Wilhelm II (1859-1941) of Germany. My research took me to the Museum Huis Doorn in the Netherlands, the former Kaiser’s home during his exile following the First World War. There, I found in the collection several Fabergé items Emperor Nicholas II gave his cousin Wilhelm II before the horrific war that would cost both rulers their thrones and the tsar his life, as well as many millions of ordinary citizens. The verified Fabergé pieces at Doorn include silver and enamel picture frames presented to Wilhelm II at an August 1907 meeting of the two emperors at Swinemünde on the German coast. Two of the frames by Fabergé workmaster Johan Victor Aarne (active 1891-1904) still contain their original photographs taken of the Tsesarevich Alexei in June 1907. One of the frames is rectangular, rimmed with two green guilloché and white enamel bands around the edge and the aperture. 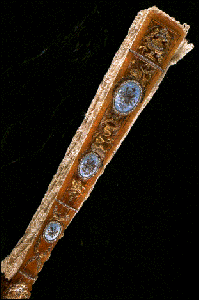 Between two enamel bands is a silver and gilt floral border. The frame contains a silver gelatin photograph of the Alexei measuring 11.6 x 9.3 cm (4 x 3 in.). The other Fabergé frame includes an original photograph of Alexei as a child in a mauve guilloché border surrounded by an outer silver gilt egg-and-dart border, and a beaded aperture. Atop the photo is a silver-gilt ornamental laurel and ribbon swag. The silver gelatin photograph is 14.4 x 7.8 cm (5 x 3 in.). A third Fabergé picture frame is rectangular with angled corners, the green translucent enamel applied with rosettes and laurel swags and bound by ribbon-tied surmount. The aperture has a bound reeded border. The frame contains an 1861 albumen cabinet card of a young Princess Augusta Victoria of Schleswig-Holstein, who in 1881 married then Prince Wilhelm of Germany (later the Kaiser). The Museum Huis Doorn notes the frame was made by Fabergé, but misidentifies the material as gilt-bronze. Unfortunately, the photographs of these three frames do not show the back or the hallmarks. How the Fabergé pieces and the other items in the Museum Huis Doorn came to be in this small, but elegant estate on the outskirts of Doorn in the Netherlands is an interesting story. In October 1918, Germany was devolving into chaos. The German Army, decimated by three and a half years of war, was reeling from Allied military successes. When Kaiser Wilhelm II met with his military commanders, they bluntly told the Emperor that his army faced military defeat on the Western Front and the war was lost. 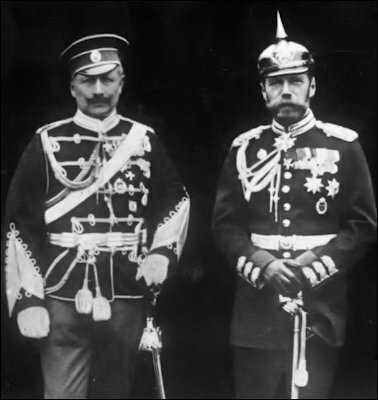 The Kaiser’s government collapsed. Civilian riots and mutinies in the army and navy rocked Germany. 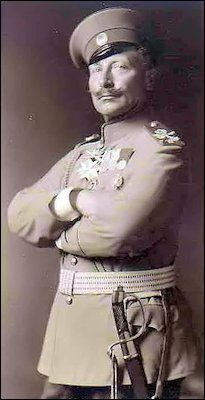 The generals advised Wilhelm in the deteriorating situation, his safety could not be guaranteed. Wilhelm II sent a note to Queen Wilhelmina of the Netherlands requesting political asylum. The queen agreed. Kaiser Wilhelm abdicated his throne on November 9, 1918, left his military headquarters in Spa, Belgium, and entered the neutral Netherlands for a life of exile. 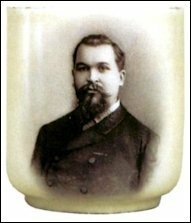 Ironically, at the same time, Carl Fabergé was beginning his own journey into exile, leaving a chaotic Russia for the relative safety of Germany. Wilhelm II, after initially accepting the hospitality of a fellow member of the Knights Hospitallers of St. John of Jerusalem, purchased the Kasteel Doorn along with 60 hectares near the town of Utrecht in the Netherlands. The owner of the Doorn estate was Baron van Heemstra-de Beaufort, great-grandfather of the actress Audrey Hepburn. The Kaiser, joined by his wife and a retinue of 40 people, modernized and remodeled the Huis Doorn, as it was thereafter known. Wilhelm was accompanied by seven railway carriages of personal items when he crossed the border into exile. The German Republic allowed an additional 63 rail cars of personal items to be sent. It was all installed in the two dozen medium-sized rooms and the attic. The Huis Doorn was resplendent with the trappings of Imperial Germany, oversized portraits of Wilhelm, other Hohenzollerns, and scenes of German military victories in the Franco-Prussian War. Crested imperial china and glassware graced the dining table. Hundreds of military uniforms and parade helmets filled the closets. Tables and curio cabinets were thick with photographs of the Kaiser Wilhelm’s extended family, cigarette cases, snuff boxes, objects of vertu, and gifts from his fellow monarchs. The exiled Wilhelm II died in 1941 at the Huis Doorn and his tomb is on the grounds. In 1945, the Dutch government appropriated the house, furnishings, and grounds as enemy property. It was subsequently opened to the public as a museum and remains as it did when Wilhelm was in residence. There very well may be more Fabergé treasures among the many items in the Museum Huis Doorn. The museum has recently undertaken an ambitious project of photographing every object and photograph in the museum’s collection and putting the images online. If you are planning a trip to the region, the museum is certainly worth a visit – and with advance notice specific items may be inspected. von Solodkoff, Alexander. 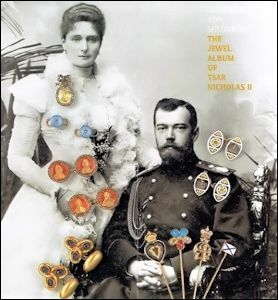 The Jewel Album of Tsar Nicholas II and A Collection of Private Photographs of the Russian Imperial Family,1997. Review of a long out-of-print title by Paul Gilbert, publisher of Royal Russia News, illustrated with a few of Nicholas II’s jewel sketches. Zeisler, Wilfried. 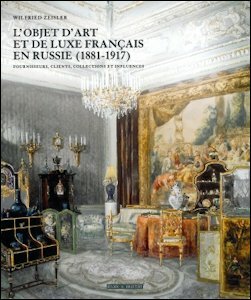 L’Objet d’art et de Luxe Français en Russie (1881-1917): Fournisseurs, Clients, Collections et Influences, 2014. In French. Book focuses on French luxury goods in Russia during the reign of Alexander III and Nicholas II, and explores the relationship between French firms (including silversmiths, jewelers such as Cartier, Chaumet, Boucheron, Keller, Lalique, Mellerio, etc.) and their Russian competitors or partners like Fabergé. 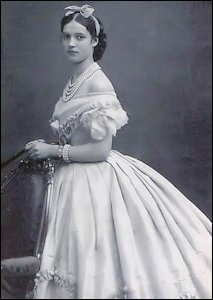 Customers of the Fabergé firm, for example, Grand Duchess Maria Pavlovna, are considered as well. Archival Video of interest to Imperial Russia enthusiasts and researchers has been compiled by Paul Gilbert, publisher of Royal Russia News. 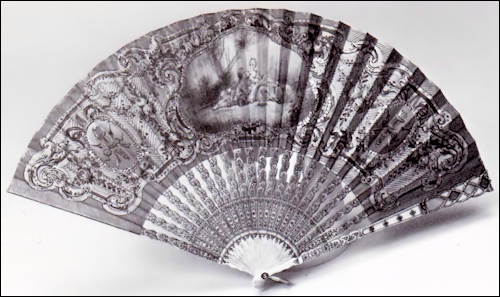 Fans with Fabergé Guards Galore! Fan enthusiast Thomas DeLeo shared two new finds for the ongoing Fabergé Fan Treasure Hunt. 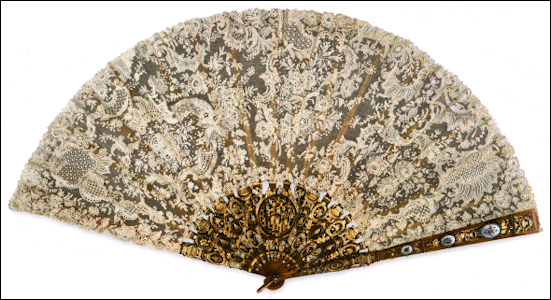 Five hundred fans representing ladies fashions from the 17-19th centuries collected by Ute Michaels were exhibited in a 1999 Grassimuseum venue in Leipzig, Germany. They are now on permanent loan in the Stiftung Schloss Friedenstein in Gotha, Germany, and are described in detail in a two volume publication by Eberle, Martin, Ein Hauch von Luft und Liebe (A Breath of Air and Love), Morio Verlag, 2014.